ATHENS - Dawg Post give its readers insight and analysis on UGA recruiting each day heading into Signing Day in three weeks on Feb. 6th. UGA staffers stopped by Lakeland (FL) today. That was almost certainly to make their presence felt around 5-star 2020 RB target Demarkcus Bowman. Bowman is one of the top backs in the country. Matt DeBary reports that Georgia, Clemson and the Gators are the three programs out front early. Kirby and Scott Fountain stopped by Mulberry (FL) today. Kirby and his red chopper stopped by Lake Wales (FL) to visit 2020 3-star QB Chayil Garnett. New TEs coach Todd Hartley stopped by Harrison today, but tweeted Wednesday that he was confident about Georgia’s recruiting efforts in Duval County and Jacksonville for the future. “Man you already know the #904 bout to be painted red and black,” Hartley tweeted of northeast Florida. Dawg Post Recruiting Board v5.2 - 5-Star RB Heading to Athens? 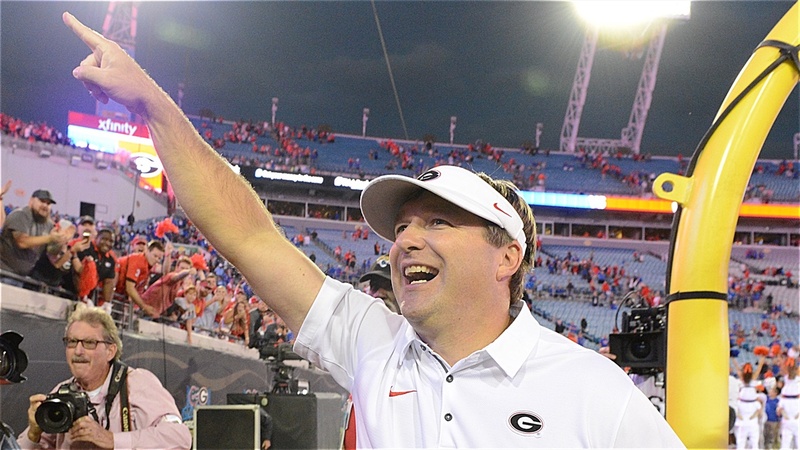 Who will fill the final spot in the UGA coaching staff for the 2019 season? Georgia is sitting at 22 commits right now. That number does not include Plumlee. The Bulldogs are “expected” to sign “about” 24 prospects this cycle. After the transfers and early departures of the last few weeks, the Dawgs have 83 known players on scholarship - 22 of which are in the class of 2019. Again, the only official number is kept by UGA, so they know more than we do on this. But we can do math, and that’s the math as it stands at this moment. Matt DeBary on Cross: The longtime FSU commit is one of the nation's top safety prospects and a guy the Georgia staff has been after for months now. The Bulldogs were in a good spot to possibly flip the 4-star defensive back with Mel Tucker on the staff, but sources say things have taken a step back since. With the hiring of a defensive backs coach and defensive coordinator coming soon, look for the Georgia staff to go all out for Cross the rest of the way. The Bulldogs needs to sign at least one more defensive back in the 2019 class, and Cross is one of Georgia's biggest targets. Most feel FSU will hold onto him in the end, but don't expect the Georgia staff to give up just yet. Matt DeBary on Elam: Elam has family ties to Florida and has been a major Gator target since the beginning of his recruitment. Elam knows he’s a wanted man in Athens as well. Missing out on Elam would be a gigantic loss to the Gators class. Elam plans to take his official visit to Georgia the weekend of January 18th. Dawg Post still feels the Gators are in the best position to land him at this time. Matt DeBary on Pickens: The longtime Auburn commitment is one of the top receivers in the country, but has stayed in contact with the Georgia staff for quite some time. He has a relationship with receivers coach Cortez Hankton. The Bulldogs would love to add another receiver in this class and Pickens is one of the best options available. He is a long, athletic kid at 6-foot-4, 200-pounds with outstanding jump-ball skills. Pickens uses his size to his advantage and should be a reliable weapon in the red zone. Pickens will likely not be able to make a final trip to Georgia before Signing Day, but many feel the Bulldogs are still in the race. Matt DeBary on Seither: With the departures of Isaac Nauta and Luke Ford, it’s easy to see why the UGA staff would want to add another tight end in this class. Dawg Post believes the newly-offered Seither is a take in this class as he was visited by running backs coach Dell McGee on Friday. Seither plans to take his official visit to UGA the weekend of January 18th. He was also visited by Alabama special teams coordinator Jeff Banks on 1/13. Some feel TCU is the team to beat right now, but new assistant Todd Hartley will give it one last chance during Seither's official visit. At 6-foot-5 230-pounds, Seither is another big body with good balls skills who can help in the passing game. Matt DeBary on Wright: There is question as to if Wright will end up taking an official visit to Georgia the weekend of January 25th. If he does visit Athens, UGA has an outside shot of landing the 5-star prospect. Tennessee has been the favorite to land Wright for a long time now, and the Vols will host him the final weekend before Signing Day. Wright plans to take an official visit to West Virginia the weekend of Jan 19th. The big 6-foot-6, 320-pounder has elite size and strength and excels in the run game. He has held his own in pass protection at multiple camps and is ranked as the top offensive tackle prospect in the country. Matt DeBary on Nester: The 4-star guard out of West Virginia is a guy Sam Pittman has visited multiple times recently. He is currently committed to Ohio State, and while many last month thought Georgia has an outside chance here, it does appear Nester will stick with his commitment to the Buckeyes.